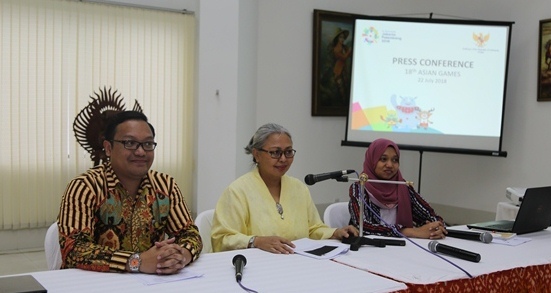 Indonesia, a country of volcanic islands, is well prepared to host the 18th Asian Games to be held in two cities Jakarta and Palembang from August 18 to September 2. Indonesia is going to host the 45-nation mega event -- the second major multi-national event after Olympics -- ahead of its general election in 2019. This is the second time Indonesia is hosting this Asian sports festivity after the 4th edition in 1962 during the era of popular leader and the country’s 1st president Soekarno. The ambassador was speaking in a press conference at her Dhaka workstation on Sunday. Murni Nyaristi and Fajar Primananda, 3rd secretaries of the embassy, also spoke in the occasion. Including some 154 participants from Bangladesh, around 15000 athletes will take part in 463 events split in 67 disciplines of 40 categories of sports -- 32 Olympic sports, five non-Olympic and three approved sports. Some 17000 sports lovers and tourists and 8000 journalists from around the globe are being expected to gather Indonesia during this event where some 13000 volunteers will be available to serve. The curtain of the event will rise at the Gelora Bung Karno (GBK) in the capital city Jakarta on August 18 and will end at the same venue on September 2. Another destination Palembang city is 600 kilometers away from Jakarta. However, Indonesia will provide free of charge transportation during Asian Games 2018 for official reporters (journalists) by Transjakarta and also 18 buses in Palembang. Asian Games is a continental multi-sport quarterfinal event, which is regulated by the Asian Games Federation (AGF). The Asian Games colourful mascots comprises Kaka (a one-horned rhinoceros), Bhin Bhin (a cendrawasih bird) and Atung (a bawean deer) while its logo represents the shape of GBK stadium.